Step 1 Preheat a waffle iron according to manufacturer's instructions; spray the inside with cooking spray. Step 2 Whisk almond milk, applesauce, egg, chia seeds, and vanilla extract together in a bowl; let sit until chia seeds start to thicken the mixture, about 2 minutes. Whisk flour, oats, flax seed meal, baking powder, sugar, and salt into almond milk mixture until batter is smooth. Step 3 Scoop 1/2 cup batter into the preheated waffle iron and cook until crisp and golden, about 5 minutes per waffle. Repeat with remaining batter. These waffles freeze beautifully. Spray a baking sheet with cooking spray. Flash-freeze the waffles for 30 minutes. Place frozen waffles in a freezer bag. Toast individual frozen waffles in a toaster oven for 5 minutes. 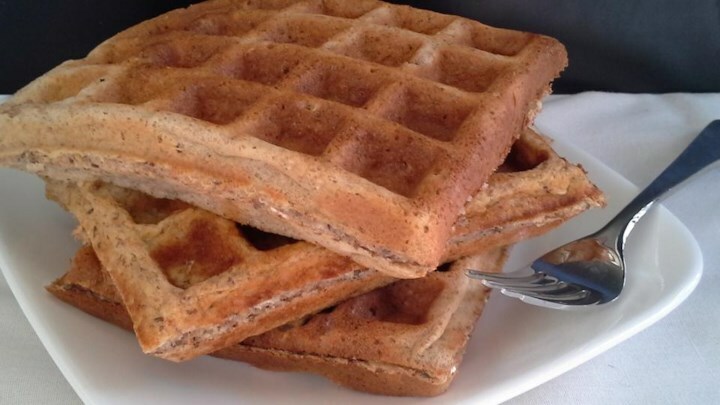 Before serving, place cooked waffles on paper towels to avoid sogginess.